Do You Speak Fluent UI/UX? The best software development teams are made up of experts, but also mentors who offer the resources needed for a successful product launch. They emphasize design in their process by taking time to understand what business problems the software should address, the kinds of people it needs to help, and how the product’s visual design must respond to users’ psychology. Since software design features so prominently at project kick-off, being able to “speak design” can make all the difference between a jolting start and high productivity throughout your project’s progression. Use our new UI/UX Design Glossary to familiarize yourself with design concepts and ux terms to limit miscommunication and wasted time. Any pains stakeholders can take to come to the table prepared to understand, discuss, and strategize a better way to deliver value to end users will be rewarded when users love their product. Gamification is the process of taking a mobile application or website and integrating game features and patterns that encourage participation, engagement, and user loyalty. Gamification takes the data-driven techniques that game designers use to engage players and applies them to non-game experiences to motivate the user to take action. Gamification can develop business-consumer relationships in ways that benefit both parties. Information architecture is the process of categorizing and organizing information in an interface to facilitate the user’s pathway therein. IA usually comes into play once the design team finishes its discovery sessions with a client, but before the actual design process begins. Asking questions that clarify the user’s identity, concerns, and end goals helps the team to organize content into meaningful classifications that inform the software’s user experience. A prototype in the design process enables teams to focus on wide-scale iteration and feedback gathering to solve pain points before committing to create and deliver high-fidelity designs. Prototypes replace long formal design reviews with rapid feedback sessions where the assets under critique may be drawn in a notebook or on a whiteboard. A/B Testing is a low-risk and cost-effective form of design experimentation. Two different versions of a design are used to determine which one comes closer to fulfilling a business need on a website or other software product. Conducting A/B testing on a design validates or invalidates assumptions made about end users’ interaction with a design element. It gathers statistical data relating to user behavior and is therefore a reliable way of optimizing user experience design. These are designed to be reliable and realistic representations of key segments of a target audience. They should be based on qualitative and some quantitative user research and web analytics. Personas help to focus decisions surrounding design components by adding real-world factors to the conversation. They also offer a quick and inexpensive ways to test and prioritize features throughout the development process. A design system offers design teams a toolkit of assets that can be used to expand existing applications or create new ones. More than just a style guide, the design system incorporates the “why” behind the reusable UI elements. Components — Typography, color, imagery, size, and spacing are essential components of a design system that can be repeated throughout a brand’s digital ecosystem. Patterns — Taking stock of repeated UI elements (buttons, forms, arrows, image settings) will help to establish consistent UIs in every interface. Templates — As the design system is fleshed out and over time, saving arrangements of design components into templates can help design teams save time in future design engagements with brand that have established design systems. Furthermore, if those engagements involve the same developers, they can anticipate the features their code must support thanks to the templated UIs. A grid system is a set of measurements designers use to align and size objects within an interface. There are many variations of the grid systems, so it is important for designers to discuss how a particular grid coheres with a development framework. For example, a mobile-responsive website requires a specific code base, which will influence the designer’s choice of formatting. Fidelity is the degree of “trueness” a design has to the product’s final form. An interstitial screen is created by designers to illustrate the capabilities supported within a given interface. An interstitial screen can convey the appearance of screens after the user interacts with certain features, like changing a filter or hovering over a feature. Designers use key screens to capture the main moments of a user’s experience within a specific software interface. A “dashboard” could be identified as a critical screen and is therefore prioritizes in the designer’s work. The importance of design in software development cannot be underestimated. Users’ fears, habits, and preferences will influence their reception of any application. By working with designers upfront, product owners and other members of the product team ensure more accurate user targeting and fulfillment of validated business needs. And while design teams should dedicate some time to educating clients in design concepts, ux terms, and best practices, diligent business-side stakeholders can and should shoulder some of the burden when it comes to clarifying expectations and requirements. Otherwise they risk losing vital kernels of information throughout ideation that can impact the final product’s overall performance. Discovery sessions require stakeholders’ full attention. Time spent deciphering technical jargon is time wasted. The terms included in this post are just a fraction of what our new resource includes. Access all 55 by downloading this free resource. Dimitar’s fascination with design started in high school and has burned brightly through as he earned his master’s degree in Graphic design. These days he works with MentorMate’s Experience Design team, crafting the UX/UI experiences for clients’ mobile and web solutions. 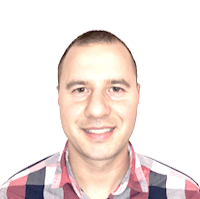 Dimitar combines emotion, analytical thinking, and hard work to forge navigable paths and positive outcomes for end users. With experience designing for an advertising firm and an e-commerce business in Bulgaria, Dimitar has been perfecting his art for years. When he isn’t busy simplifying user experiences alongside his twin brother, Eddy, Dimitar loves to travel, watch movies, and stay active. Does Digital Healthcare Have a Future Without UX Designers?